Shop at April Cottage Cards and raise funds for the charities Juvenile Diabetes Research Foundation (JDRF), Butterfly Conservation, National Rheumatoid Arthritis Society (NRAS) and King Jesus Orphanage. Your own church can benefit too! (To find out more, click on the link How can my church benefit?) 50p from every card, £1.00 from every mug and £2.00 from memory sticks goes to charity, even if you make use of offers and multibuys. Before you start shopping, simply add your chosen charity or church to your basket. If more than one charity is added to your basket, those charities will benefit equally. If no charity is selected, the profit will be split equally between NRAS, JDRF and Butterfly Conservation and King Jesus Orphange. You can choose your charity from the Shop page or click here Select Charity. 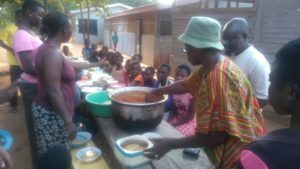 King Jesus Orphanage is in Ghana and currently gives a home to 80 orphans and also runs a school for the orphans and locals who would otherwise be unable to access education. There is no welfare system in Ghana so children from families where the parents have died are extremely vulnerable to neglect and abuse. In many cases the children are brought to the orphanage in the most desperate condition imaginable. The orphanage is run by volunteers with a few teachers being paid the little the orphanage can afford so every penny you give really will benefit the children. Rheumatoid arthritis is a debilitating autoimmune disease that affects both body and mind. NRAS is an invaluable resource for sufferers, helping them to live their lives as fully as possible by offering them support on every step of what can be a rather erratic journey and keeping them informed about their options at every stage. In the last five years, Butterfly Conservation has embarked on some of the biggest butterfly projects to save the most threatened butterflies and moths. It manages reserves all over the UK and operates many schemes to monitor and manage the health of butterflies and the overall environment. Education programs in primary schools and beyond are also an important part of Butterfly Conservation’s work. Being diagnosed with type 1 diabetes brings its difficulties at any age but the Juvenile Diabetes Research Foundation carries out research to make the lives of children living with type 1 as near normal as possible. Their long-term aim is to find a cure but projects currently running include trialling an artificial pancreas which keeps sugar levels much more regular and reduces the need for injecting insulin. Select Charity or Shop now!